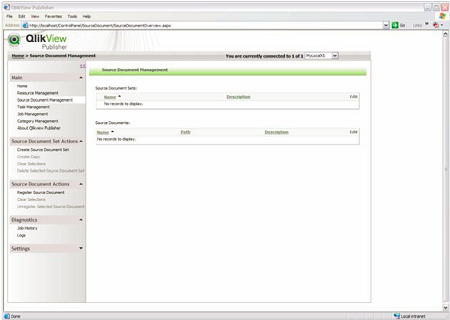 Qlikview Publisher is an additional component to the Server infrastructure that allows for document distribution. We’ll look at this in a little more detail to examine the capabilities and technology. This is a separate application, and as such, has additional licensing costs. In addition, the PDF distributor is an additional server license cost as well. However, efficient data distribution is often a high priority for many organizations. Some users may only want an end file distributed to them, not access to the whole Qlikview desktop or Web client. In a smaller business setup, this may be a little bit of overkill though so its really designed for an enterprise level deployment. In a smaller deployment, Qlikview Server is probably sufficient. One of the chief benefits of the Publisher tool is to build document copies that are personalized to the individual users. This can mean that users in a specific department for example, get only local department data. From a technical perspective, this means that Qlikview documents are divided into blocks containing data for the correct users or user groups. Security is not built into the files, but it uses OS (Windows) level security and administration. Currently, its not compatibile with Linux or other OS technology. The data repository used is in the form of XML documents, that are backed up by the system administration. This type of architecture is a little different than some other vendors architecture. Microstrategy, for example, recommends a separate repository for its Distribution Services, especially in a highly scaled infrastructure. Qliktech does recommend having this component separate from the main Server to aid in performance and scalability. When this is enabled, it takes the load of document refresh and dataload from the server and handles it directly. The Server is used to process data to the clients, either Web or desktop. Separating the tasks can improve performance.